Using coded infrared (IR) transmitters mounted on transit vehicles, the Opticom IR platform communicates securely with the intersection traffic controller to request a temporary right of way. 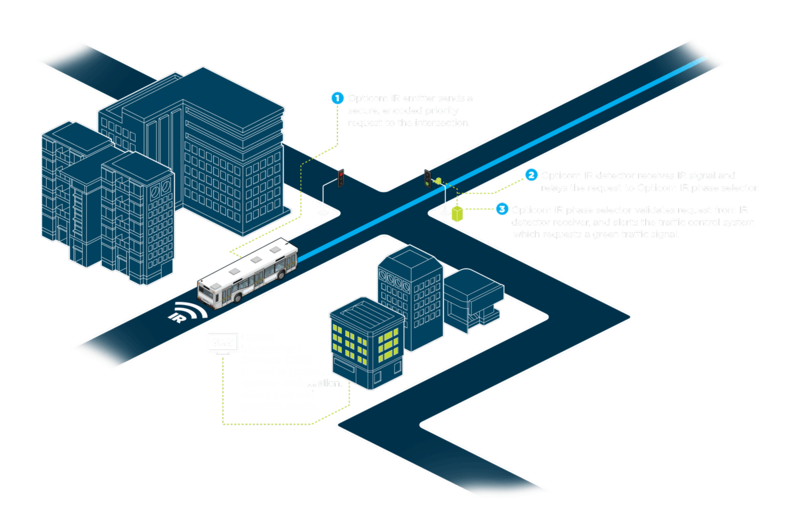 Transit managers get a high level of intersection control using this line-of-sight Transit Signal Priority (TSP) solution from GTT. Built on more than 45 years of Opticom signal priority performance and reliability, the Opticom IR platform is installed in thousands of vehicles and intersections worldwide. GTT’s legacy IR platform provides the intelligence to improve transit operations and realize immediate savings. The Opticom IR platform brings together a combination of proven hardware, advanced software and comprehensive services to enable operational efficiencies for transit agencies of any size. Proven results from GTT’s solutions. See GTT in action. Watch how we work with communities to drive better outcomes. Industry experts at your service. Join GTT at a future event. Locate a GTT Regional Manager in your area. Get in touch with an industry expert. Learn about GTT solutions by viewing an archived webinar.